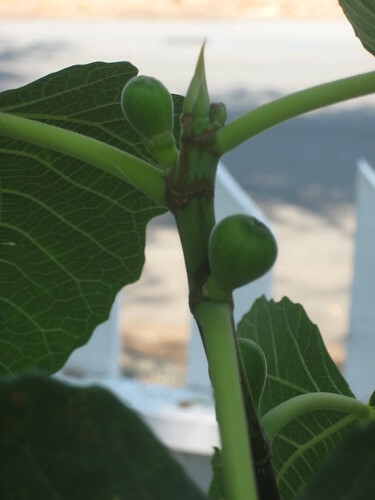 I do not know what is happening with the bugs this year but they are devouring our plants. We have a lovely little strawberry patch that has treated us well for a few years now. Of course there are always some we lose to the bugs- it’s inevitable, but this year it seems they are cleaning up our patch. Every strawberry we go to pick has something eating it on the other side. It’s very frustrating. The “bug juice” consists of canola/veggie oil and soy sauce – it is FABULOUS! We used to do beer in a cat food or tuna can but beer evaporates too quickly AND who wants to waste beer! In our house that’s blasphemy. Plus at the cost of the beer we like to drink – WAY TOO expensive to be using to catch bugs. Anyways – we’ve lost a couple veggie starts also to the little buggers. Our raised beds seem to be unharmed, but anything that has been planted throughout the rest of the garden is taking a beating. Ryder is upset about the roly poly’s that are falling victim to the bug juice so we need to empty the contents of the containers without him. He LOVES his roly poly friends! I have tried to be more Zen about the snails – if I do find them sludging around the garden, I pick them up and put them in our green waste bin. That way – once they leave our property – I have nothing to do with what happens next (even though technically I do since I put them in there) but I feel a bit more Buddhist about not harming them. But whoever falls victim to our bug juice, well, it’s survival of the fittest and I like my veggies to be slug/bug free or at least just not devoured by them – I would actually like to eat them. To make up for the graphic images of the slugs meeting their untimely death I will end with some pics from around our yard……..
this year we are trying upside down tomatoes – I’ll let you know how they work out. our new ultra dwarf nectarine (haven’t even put it in the ground yet). How is your garden doing? Anybody else experiencing the destruction of our little garden foes? The strawberries have arrived! I love this time of year, fresh strawberries from our little patch. 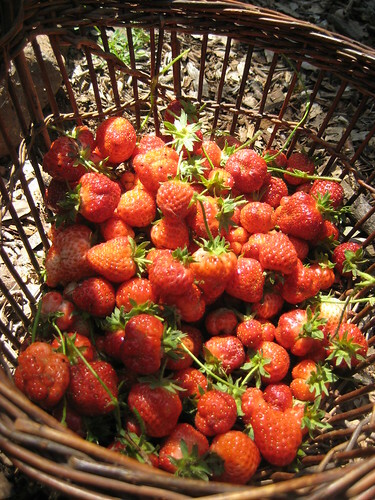 It is so wonderful to go out and pick a basket of sun warmed strawberries. We’ve been eating them in cereal, on shortcakes (with yummy homemade whip cream- even though fruit and cream are a no no in the Ayurveda world- once in a while won’t hurt), in smoothies, on waffles, in salads or sometimes the best way just by themselves. So far, this year, we’ve gotten to them before the bugs have – there have been a few casualties but not like the past. We use our own homemade bug-be-gone remedy….. canola/vegetable oil and soy sauce- about a 3/1 ratio. The soy attracts the bugs and the oil keeps them in the container (we use cat food cans or tuna cans). It’s perfect and organic! This has been the best bug control we’ve found. We used to use beer (which also works) but it evaporates quickly and we have a hard time justifying wasting beer (we like our beer). THe lettuce is crazy, we can’t keep up with eating salads (I’m not complaining). I’ve been piling the lettuce on my cheese sandwiches I take to work. It’s so yummy. 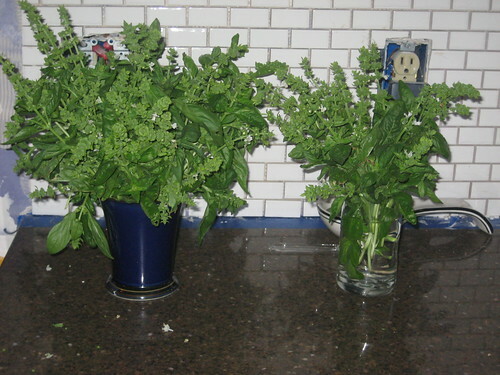 The arugula is so peppery and good. I can eat it all day. 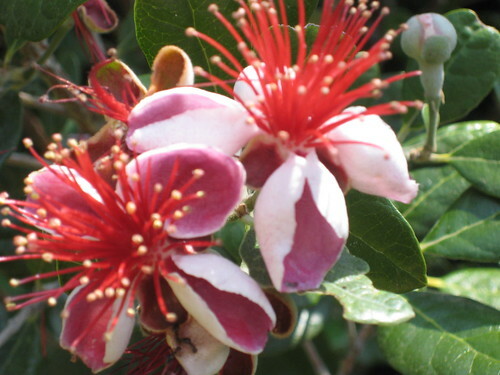 Our strawberry guava trees are adorned with flowers so this is going to be a great year for guavas. 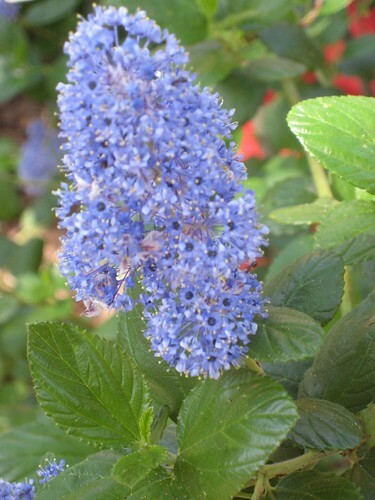 These are awesome bushes, they are great along a fence line for privacy, you can prune them and keep them smaller or let them get bushy, they keep their leaves all year and the flowers are edible and beautiful. And don’t forget the fruit is heavenly! Doug always says “it’s the fruit of the gods”. Now that we’ve been getting food from our garden again, I’m getting so anxious for that first tomato – I can hardly wait! But that’s what I’m going to have to do, wait! Oh, but that first bite is going to be so worth the wait! It’s that time of year, the farmer’s markets are back. For the few lucky ones, there are some that go year round (we have one that is year round in our town). It’s fun to see how it changes as the seasons change. In the winter it’s pretty small and not much there, but it feels good to go and buy a couple things from the local farmers. It’s also a good way to see what’s “in season”. So, I just finished a section in Animal, Vegetable, Miracle that was talking about “Organic” food and the mainstream corporations that are now starting to offer Organic. It’s a bit of a double edged sword. In one way I think it’s great that you can buy Organic at Safeway or Costco or whatever big store you may have in your town. It’s getting it out there to the masses, making it available and slightly more affordable to those that maybe wouldn’t buy it normally from a speciality market. But playing the devils advocate, those big corporations are potentially ruining the term Organic. These corporations are lobbying to reduce the standards of organic (to make it more profitable for them- of course- it’s all about the bottom line- not doing the right thing for the consumer or the community). For example, they have lobbied so the Organic, free range eggs you’re buying aren’t really coming from these happy hens running around beautiful acres of fields, foraging for grubs, etc. They are only required to have a door on the hen house that leads to a small area outside to be certified as “free range”. Most of those hens never see the light of day. That’s a far cry from the image they portray or that we perceive in our heads. I don’t know about you but I certainly don’t want to give my money to those people. They are lying to us! This is one of our favorite activities to do as a family too. We usually don’t make it home with some of the fruit we buy. Ryder likes to go and help pick out the fruits and veggies and it helps him to see us supporting someone rather than a store. 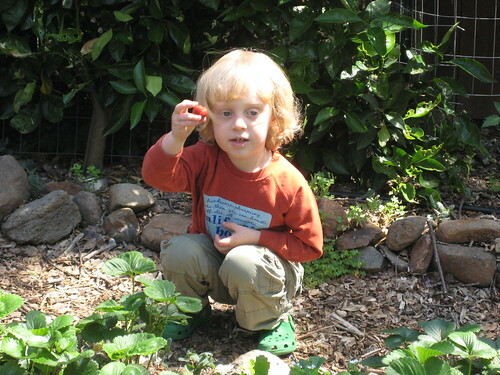 We grow a lot of our own fruits and veggies so he understands the whole concept of growing and tending to the plants and finally picking them- he loves to pick strawberries. It’s the best to look over and see his red stained face, hands and shirt. What could be better than picking a warm strawberry from your own garden and eating it. He is so proud of his plants. Every morning we open his curtain and look out on the garden and see how much the plants grew! I hope this will carry on through his life. Go to the link at the right for farmer’s markets to locate one near you. Our wild lilac is in full bloom- this is my favorite time of year. I just love wild lilac bushes. Everything is in bloom and the plants are starting to buzz with bees, the hills are emerald velvet and our lilies are starting to burst out of the dark, wet dirt from their winter slumber. I am so inspired. I can not wait to get our garden going this year. Last year I was pregnant and had my focus on other things (i.e. creating a little person, building a deck, finishing our cottage, etc). I did get things planted but did not tend to them as I should have. I missed all my fresh veggies- we had some but not like in the past. So this year I’m getting back to the earth. The first quarter issue of Organic Gardening’s feature article is about tomatoes. Oh, how I love my fresh garden tomatoes, I won’t buy tomatoes at the store- once you have organic heirloom tomatoes right off the vine from your backyard – nothing compares. So I can not wait to get my tomatoes going. 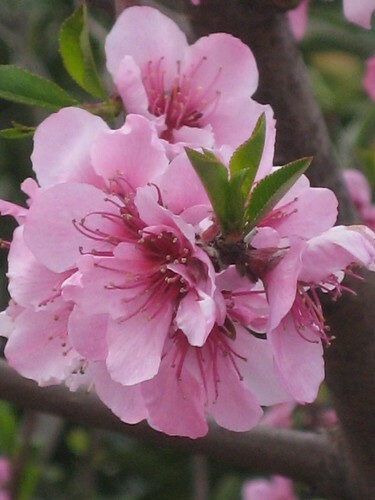 Our peach tree is in full bloom too. The flowers are so vibrant and beautiful. 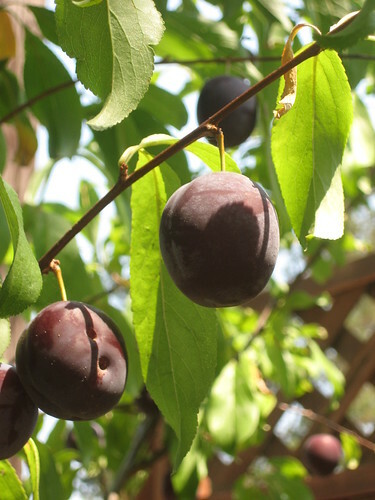 This will be our second year with a lot of our fruit trees so I’m hoping for a better crop. We actually had a nice crop last year (surprisingly for the first year). So this year should be even better. 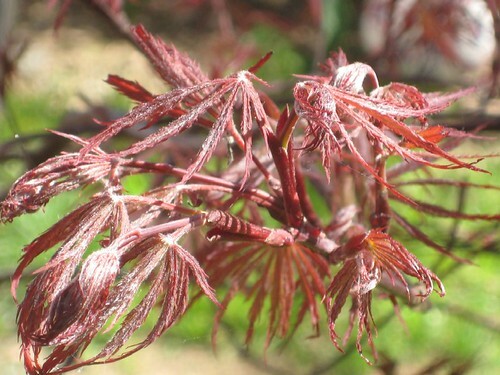 One of our Japanese Maples’ buds opened, displaying its delicate leaves. This “Red Dragon” was a father’s day present a few years ago. We celebrated Springs arrival by hanging a bird feeder in the backyard. 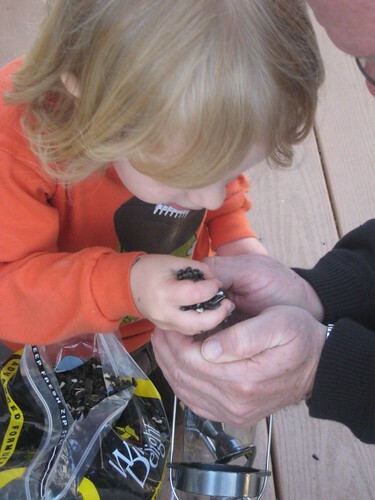 Ryder and Papa Bill filled the feeder. Ryder was so excited to get it hung- he really wanted the birds to come and eat. But to our dismay no birds have visited yet. I think we provide so many other food sources (i.e. all of our trees, bushes and plants) that they don’t need to come to the feeder. So Ryder is sad- he asks “why don’t the birds come to eat?” Hopefully they will start to frequent our feeder. I also cleaned out my brush and left my hair outside for the birds to use for their nests. Let me tell you, with all the hair I’m losing (from these crazy hormone fluctuations) these birds can build a high-rise! I would have liked to do more to celebrate springs arrival- but as I said before – things have been turned upside down with the guests. Not that we weren’t happy to see everyone- it just changes our “routine” – which is good- sometimes it needs to get mixed up a bit.